AE210P is a generic SoC platform IP which provides users with high flexibility, low cost and fast time to market for micro-controller applications such as Internet of Things (IoT) and Wearable Computing. To minimize the cost, the bus structure of AE210P can be simplified to one APB only. To maximize the performance, AE210P can be configured to add an AHB bus matrix. 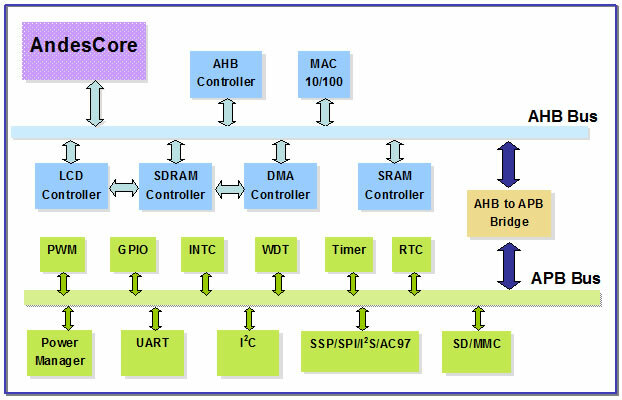 All the bus controllers, bridges, and peripheral IPs of AE210P are designed to minimize the access latency, the logic gate count, and the power consumption. Through the provided interfaces, users’ designs can be easily integrated to the platform. 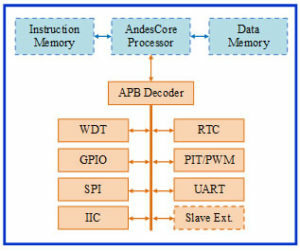 AG101P is a generic SoC Platform IP that works with any of AndesCore™ processors to provide a cost-effective and high performance solution for majority of embedded systems in variety of application domains. Users may simply attach their IP on one of the system buses together with certain glue logics to complete a SoC solution for a specific application. With comprehensive simulation and design environments, users may evaluate the system performance of their applications and track bugs of their designs efficiently. The optional hardware development platform further provides real system environment for early prototyping and software/hardware co-development.